Blacktown’s name has its origins in the Stolen Generation as there was a ‘Native Institution’ here in the 19th century. Blacktown Aquatic Centre has one of those outdoor swimming pools that look so tempting when you speed past in the train. When I spotted it over the tracks, it looked pristine, with sky blue tiles looking magnificent in the sunshine, and seemingly hardly anyone in it. It proved a bit harder to get an actual swim in Blacktown! My first failed attempt was in trying to go in April, when the pool had already closed for winter. That day it lay looking a bit sorry for itself, the water a slimy-looking green. 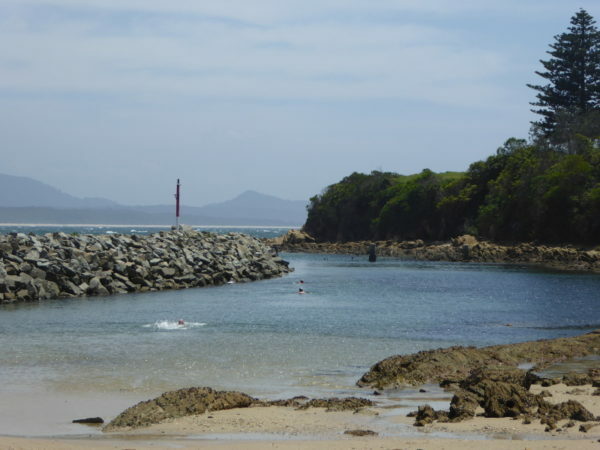 It’s a long way to Blacktown from Kiama, so on that day, I went against all my instincts and had a swim in the indoor pool. It was actually quite a pleasant experience and something I might have to get used to through the winter months in cold-averse Victoria. When I got back to Blacktown mid-morning in late November, I could hear the shrill sound of hundreds of kids’ shouts and screams before I’d even made it to the Aquatic Centre itself. That’s never a good sound if you are wanting a chance to take photos and to do 20 or so stress-free laps. Sure enough, reception told me that local schools would be using Blacktown outdoor pool every day for the next two weeks, so this was my last chance before we move to Victoria next week. The kids were all still in some pre-swim session on the grassy areas nowhere the pool when I got in and began my laps. So for a minute, I thought my luck was in. But ten laps in, I was joined by 100 kids in 6 groups of 16 or so practising getting in and out of the water and rescuing. Now, I’m all in favour of schools teaching this kind of thing, and it’s great to see local resources being used in this way. So I’m not about to grumble about the crowd. But…in this day and age, the arrival of 100 or so school kids meant the disappearance of my camera and no photos of Blacktown pool beyond the one I managed of my lap just before getting in. So quick description: lined by beautiful gum trees on three sides, with the changing rooms and indoor pool on the other side; in November, fantastic jacaranda blooming down at the deep end; trains dashing past, visible through those trees. It’s a fairly narrow pool, with only about 6 lanes, but lovely water temperature, producing approving noises from lots of the youngsters throwing themselves in and clearly a bit wary of how cold it might be! The trains might zip past Blacktown Aquatic Centre, but Blacktown train station is still about 10-15 minutes walk away. Lots of parking by the pool if you come in the car. Outdoor pool closed in winter. Indoors there is another 50m pool. Entrance fee $6.20 in 2017-18. 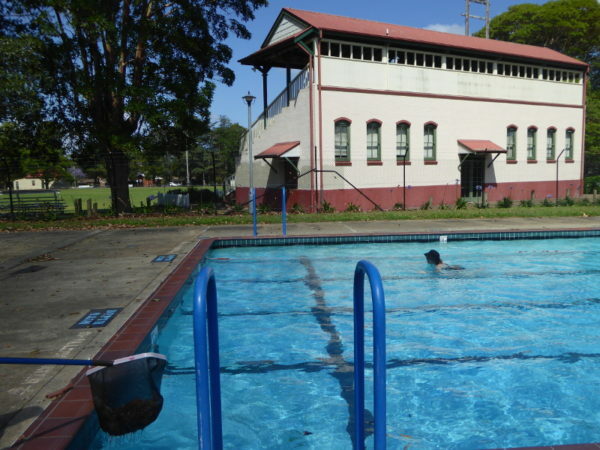 The pool opened for the first time in 1961 as Blacktown’s War Memorial Pool. 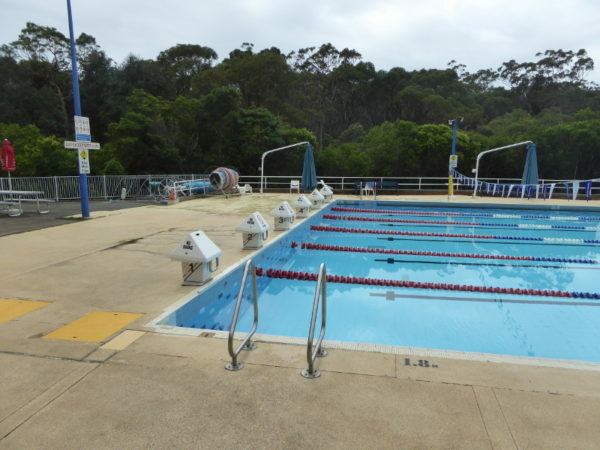 The pool was used by one of the Olympic swimming teams as training centre for the Sydney Olympics. And Olympians Kieran Perkins and Ian Thorpe trained here at Blacktown. 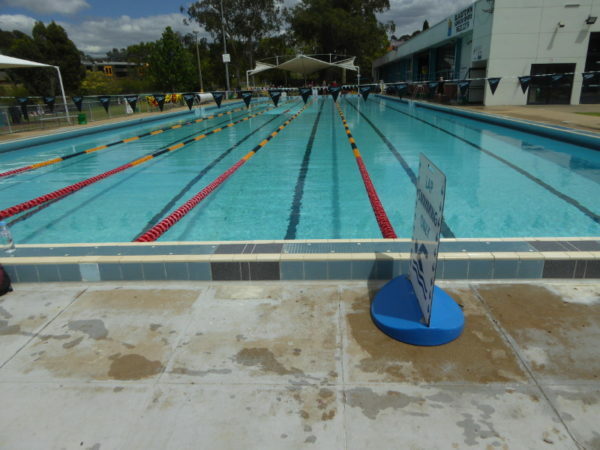 This 2013 blog piece is quite political but does also include some usefuls tidbits of information on Blacktown Pool and its past users. And this article from 2015 talks of new funding to improve Blacktown aquatic centre – in English as well as Chinese! It’s a bit of a trek to get decent coffee in Blacktown, and not that easy to find among the very average coffee on offer in most places. Just moved to Blacktown, didn’t even know the pools existed – only though anything related was Wet N wild. Would have to give this a try during the warmer months. I have only been to this pool twice – 1993 and 1995 – for School State Championships. My grandfather recorded me swimming my leg of the relay in 1993 on his camcorder, but I ended up recording over it because I was embarrassed with my performance! Can’t remember what happened in 1995, aside from just being there. Weird.